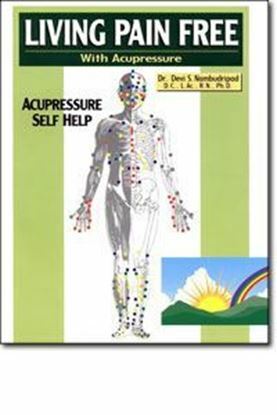 Living Pain Free With acupressure By - Devi S. Nambudripad, D.C., L.Ac., R.N., Ph.D. Paperback-1st Edition 1997 201 pages, 8.5’ X 11’ X 5’’ ISBN: 0-9658242-0-9 This self-help book with illustrations in colors will help you understand how to expand your body’s natural power to promote and maintain health and well-being. This do-ityourself acupressure handbook is easy to use with more than 130 illustrations and provides definitive treatment plans for 280 health conditions. This book is the ultimate resource for people who want to learn about treating their illnesses and healing themselves using noninvasive procedures. Your body is already equipped with the necessary tools for gaining and maintaining good health. All you need to do is learn how to use them. This book shows how to self-balance your energies on a daily basis and maintain a sound immune system. Or if you are faced with some sudden allergy attacks how you can use simple acupressure procedures and help you stabilize your condition permanently or until the help arrives. Everyone must own one of these books. This can serve as a security blanket that can also protect you and guide you in need. If you own an animal and if it suffers from any symptom, it may be worth investigating if the symptom is due to an undiagnosed allergy. Eliminating Your Pet’s Allergies will educate you about the many common everyday ailments your pet may suffer and show you the most common causes lead them to that ill-health. Just like humans, pets can suffer from myriad allergies and suffer from any number of manifestations. Have your pet examined and tested by an NAET specialist. You will be surprised how easily you may be able to give relief to that animal. 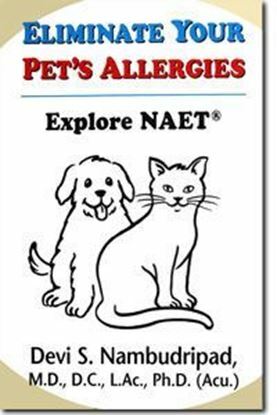 This book shows how many of the symptoms the pet suffers may be from simple allergies to something it is eating, drinking or contacting on a regular basis. The number one reason why pet-owners visit veterinarians is because of acute or chronic allergic reactions that affect the skin. But this book will show you that skin is not the only organ affected by allergies. In fact, any symptom you can think of may be the result of an allergy of some part(s) of the body to just about anything in the universe. This book will show you how you can help your pet get out of that allergy world and live normally. The author also shows you a few animal self-help acupressure points that can enable you to help your pet on your own in your privacy of your own home. Eliminate Your Pet’s Allergies will educate you several ways to track down the causes of your pet’s illness and help you find the right help if your self-help tips become insufficient to restore it’s health. Interesting testimonials from several pet owners make the book interesting. Anyone who owns a pet must read this book in order to maintain a peaceful life with a pet.